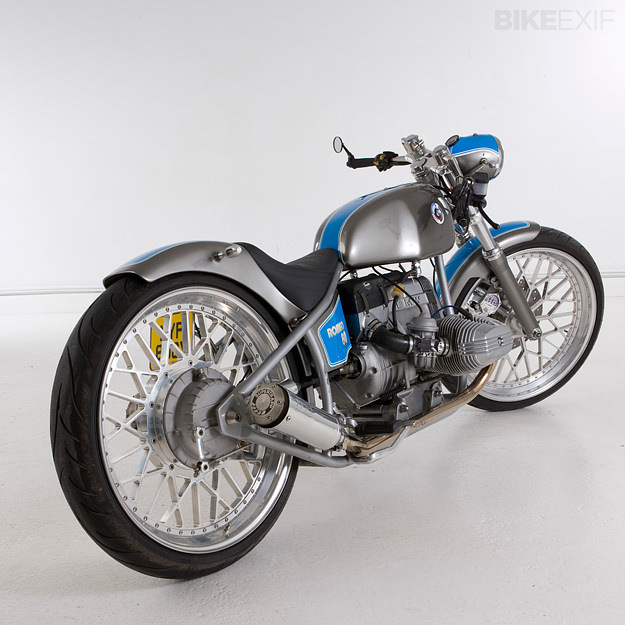 Most custom BMWs are resto-mods or café racer conversions. But Ian Solley of 7 Ages in the UK likes to take the strasse less travelled. 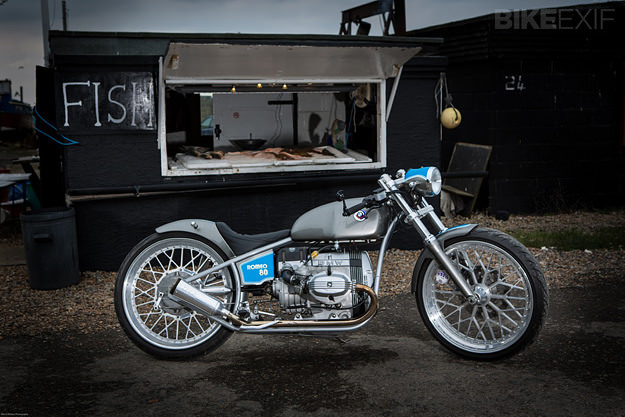 On this BMW R80 custom, virtually every part has been modified: the frame has been converted to a hardtail, and the forks are from a Harley-Davidson FXD. 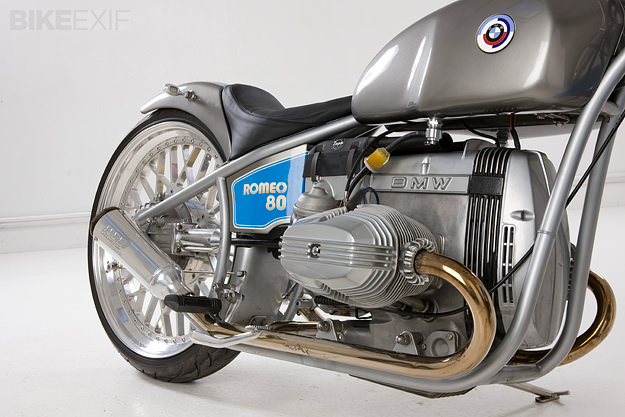 And different Romeo 80 certainly is. The heavy lifting on the frame was done by Dave Batchelar of P&D, one of England’s most renowned fabricators. The tank was reshaped a little to fit the lines of the new frame, and Batchelar also created the side panels, front fender and rear fender/seat unit—which is a work of art. Solley reconditioned the motor and carbs before cleaning and detailing them and installing the powerplant back in the frame. 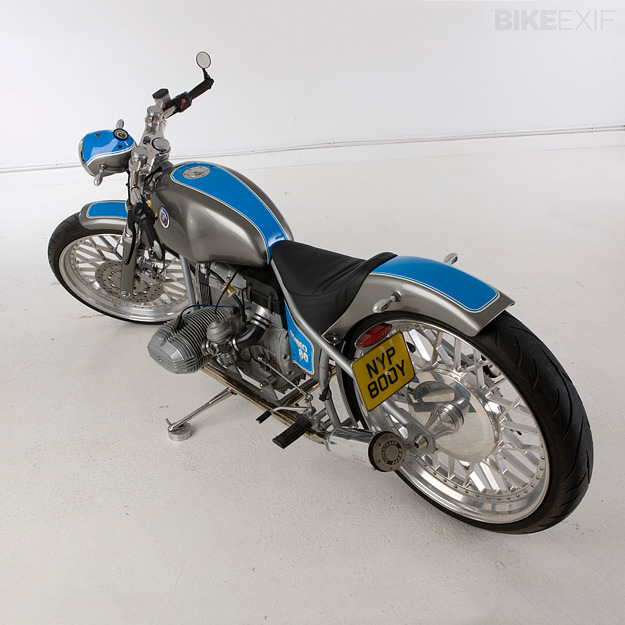 He added Supertrapp race mufflers to the stock header pipes, and installed custom-made bars, Oberon indicators and mirrors, and a modified Harley headlight. Sitting in the headlight bowl is a tiny Motogadget speedo. The 23” wheels are a whopping 5” larger in diameter than the stock BMW R80 hoops, but Solley has retained hints of the classic BMW snowflake pattern. 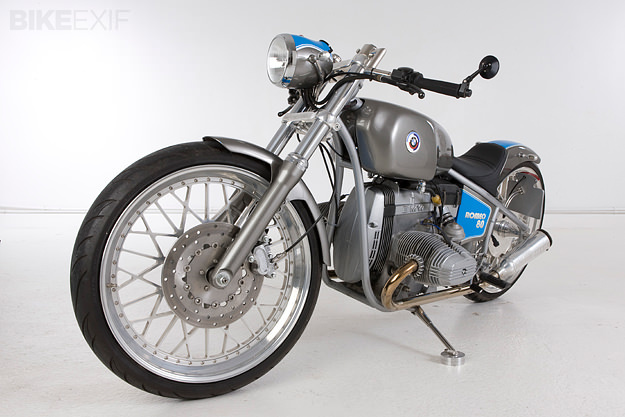 The rims were built by Steve Taylor of Taylor-Made Wheels and the two-tone paint, echoing the traditional BMW colors, was applied by Classic Cycle Works. It’s one of those bikes that on paper shouldn’t work, but in the metal, it somehow does. To see more of Ian’s inspired creations, head over to the classy 7 Ages website. Location image by Merry Michau | Studio shots by Mike Prior.